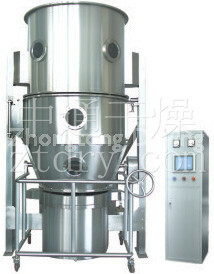 FL-B Series Fluidized Granulator - Changzhou Fushite drying Engineering Co., Ltd.
● Phamaceutical industry: tablet, capsule, low sugar or no sugar granule of chinese medicine. ● Foodstuff: cocoa, coffee, milkpowder, juice of granulate, flavoring and so on. 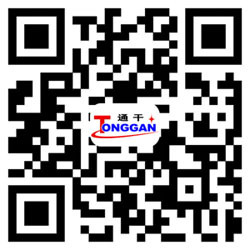 ● Other industries: peticide, feed chemical fertilizer, pigment, dyestuff and so on. The powder grannle in the container (fluidization)appear in the state of fluidization. It is preheated and mixed with chen and heated air. At the same time the solution of adhesive solvent is fogged and sprayed into the container. It makes the some particles become granulating that contains adhesive. 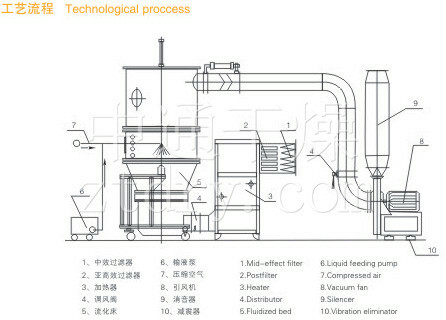 Being of unceasing dry through hot air, the moisture in the granulation is evaporated and the adhesive is solidification. The process is carried out continuously. Finally it forms ideal, uniform and Porous granules. ● The equipment has no dead corner. Therefore the loading and unloading are quick and light and clean. It can meet the requirements of GMP. Overall dimension L×W×H m 1.0×0.6×2.1 1.2×0.7×2.1 1.25×0.9×2.5 1.6×1.1×2.5 1.85×1.4×3 2.2×1.65×3.3 2.34×1.7×3.